I, who once was what you are, you will be what I am. passing through an arch and across the Río Odrón, take the route through farmland and more vineyards towards the hamlet of Sansol. On a hill not too far away is the Basilica of San Gregorio Ostiense. Legend has it that in the 11th Century the Navarra region had succumbed to a plague of locusts. Pope Benedict the 9th sent along San Gregorio de Ostiense to look at what could be causing the plague. He concluded that because the local people were of low moral character and had lost their devotion to the church, that the locusts were a punishment from God. He ordered this behaviour to stop and soon after the plagues ceased. The local people, so happy with what had happened, did not want him to leave and San Gregorio remained in Logroño until his death in 1044. Following his death two bishops, the bishops of Nájera and of Pamplona, wanted San Gregorio to be buried in their respective cathedrals and an unholy row erupted. It took the intervention of the King of Navarra, who ordered that a tomb be built on neutral ground, to end the row and subsequently the Basilica de San Gregorio Ostiense was built over the tomb of the saint. 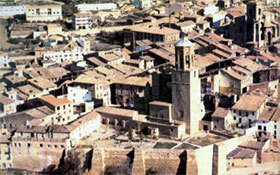 After 7 kilometres you reach the hamlet of Sansol which gets its name from the patron saint San Zoilo. There is a private hostel here as well as a café and restaurant that offer a Pilgrim menu. From the forecourt of the Iglesia de San Zoilo you can see your next port of call, the village of Torres del Río, down below in the Río Linares valley 1 kilometre ahead in the distance. Leave Sansol by crossing the main road and walking down hill and across a stone bridge over the Río Linares, climbing up into the village of Torre del Río. The village has 3 refugios, a bar/restaurant, a shop and a bank as well a beautiful 12th century Romanesque church, la Iglesia del Santo Sepulcro. 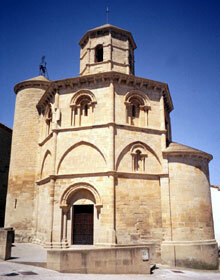 The church is octagonal in shape and is believed to have been built by the Knights Templar. Its design is similar to mosques found in southern Spain with Byzantine and Hispano-Arabic influences. If you want to visit the church you will need to ask for the key and possibly make a small donation. 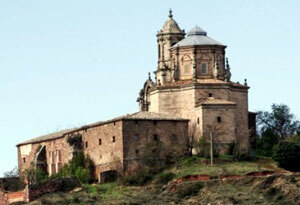 Head out of Torre del Río up through some orchards, past the cemetery and onto a dirt track. Continue along this track past the Santuario de Nuestra Señora del Poyo. Looking out over the open countryside you should be able to see Viana and your final destination on this leg of the Camino de Santiago, Logroño. From here the route rises and falls as you walk in and out of the valleys. Following a dirt track you drop down into the Cornava valley and then back up again over the main road and into the outskirts Viana. Taking the Calle Algorrada walk through the archway through the high walls surrounding the town and onto Rua de Santa María. The heavily fortified town of Viana was founded by King Sancho III known as El Fuerte (the strong) in 1219 as a defence against the Kingdom of Castile. During peacetime the town needed to make alliances with the surrounding villages and therefore opened up the town as a trade route. Over the years the Kingdoms of Navarra and Castilla continually fought over land and in 1507 sees the town come under siege again. It is during this siege that the infamous Cesare Borgia loses his life. Cesare Borgia was the son of the equally infamous Pope Alexander VI and brother to Lucrezia. A very capable general in his day, he was exiled to Spain by Pope Julius II and was imprisoned in the Castillo de la Mota. Cesare managed to escape and went to join his brother-in-law King Juan III of Navarra who made him captain of his army. This ultimately led to his death at Viana whilst trying to overthrow the Count of Lerin. 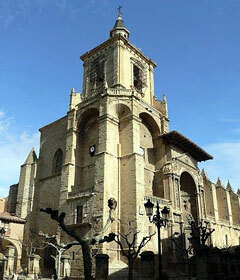 One of the best buildings in Viana is the impressive gothic Iglesia de Santa María, built between 1250 and 1312, with the Renaissance style tower being added in the 16th century. Cesare Borgia's remains were initially buried in a marble tomb beneath the altar. His debauched and sinful past so angered the church that, following a visit by the Bishop of Calahorra in 1527, his remains were moved and buried beneath a cobbled pavement in un-consecrated ground to be “trampled on by men and beasts”. His remains were dug up accidentally by workmen in 1945 and moved to the town hall. Over the years there have been many requests by the locals to give Borgia a proper burial which the Catholic Church has constantly rejected. However, in 2007 the Archbishop of Pamplona finally relented and agreed that Borgia could finally be re-buried within the church on 11th March 2007, 1 day before the 500th anniversary of his death. Continued on Stage 7 - page 2.